This older book was originally written in 1871 in support of the Temperance movement. 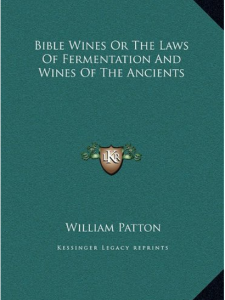 Patton is almost always quoted by later writers because of his valuable collection of ancient authorities on wine. I found his discussion of how fresh juice was preserved, and how the word is used consistently in Scripture very helpful. He is also a good example of the older, accepted view among conservative, that is, of total abstinence.